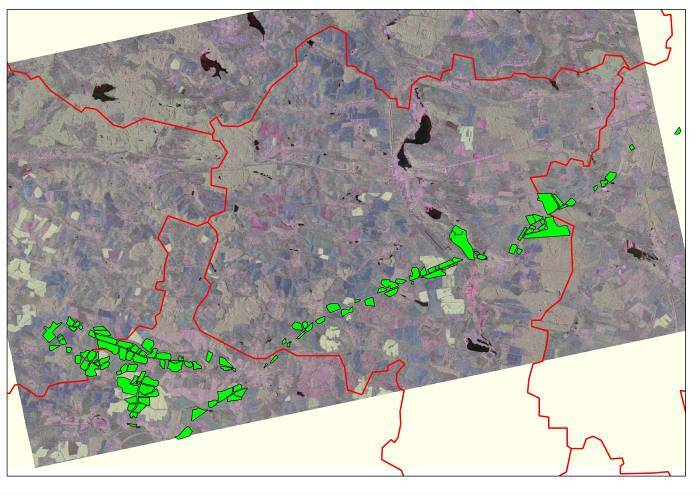 Space Research Institute (SRI) NAS Ukraine and SSA Ukraine has been involved in several projects and feasibility studies on the efficiency assessment of using satellite images to crop mapping and crop area estimation. These studies mainly involve optical satellite imagery, and results achieved so far show particular difficulties in discriminating summer crops in Ukraine such as maize, soy beans, sunflower and sugar beet. Therefore, SAR satellite images, in particular Radarsat-2 quad-polarization, are incorporated in order to improve discrimination between summer crops. The SOAR-JECAM project titled “SAR parameters optimization for crop classification” (no. 5102) aims at optimizing SAR parameters to provide timely and economically efficient crop maps/area estimates for the Ukrainian landscape. - Gorodotsky district in the Lvivska oblast with total area of 719 km2 and 18.2 thousand ha of cropland. Within the SOAR-JECAM project Radarsat-2 images were acquired in 2012 and 2013. Four (2012) and five (2013) Radarsat-2 scenes were acquired for the Vasylkivsky district, and two Radarsat-2 scenes were acquired for the Gorodotsky district in 2013. Eight more scenes are planned to be acquired for the Vasylkivsky district to provide high temporal resolution for crop mapping and crop area estimation tasks. SAR images are complimented with freely available optical imagery, in particular EO-1 (2012) and Landsat-7 and Landsat-8 (2013). SAR images are filtered using refined Lee filter (7 by 7 pixels) and converted to the Pauli decomposition. Optical satellite images are converted to the top-of-atmosphere reflectance. Table 1 summarizes information on satellite images. Ground measurements were performed in 2012 and 2013 to collect ground truth data (Table 2). Classification of satellite imagery is performed using three different classification techniques: neural networks, SVM and decision tree (DT). Crop area estimation is performed using a simple pixel counting approach which is known to be biased. Therefore, the derived crop area estimates with pixel counting are corrected according to the following expression: Bias = Commission error – omission error. For the Vasylkivsky district (2012), the MLP classifier slightly outperformed the SVM and DT classifiers reaching the overall accuracy of 80.4%. User’s and producer’s accuracies are determined for the best trained MLP classifiers when using only optical images (EO-1), only SAR images (Radarsat-2), and its combination. The major impact of adding SAR images to optical images is found for sunflower and sugar beet classes while there is no gain for other crops. The addition of SAR results in an increase of user’s and producer’s accuracy by 6.6% and 3.5% for sunflower, and by 13.3% and 5.0% for sugar beet, respectively. The final classification map for 2012 is shown in Fig. 1. Fig. 1. Results of classification of Radarsat-2 and EO-1 images using a multilayer perceptron (MLP) for Vasylkivsky district of Kyivska oblast. The obtained map is used for crop area estimation using a pixel counting approach. The obtained results are compared to official statistics. The satellite-derived crop areas were higher than official statistics in 2012. The relative error was +11% to +46.5% with an average of +33.9%. The acquired satellite imagery and collected ground measurements in 2013 (Fig. 2) for both test sites will be used for crop mapping. The processing of these data sets and generation of crop maps is a work in progress, and corresponding results will be reported in future reports. The benefits of using Radarsat-2 for crop mapping in Ukraine (in particular, discrimination between summer crops) are investigated. The major impact of adding SAR images to optical images has been found for sunflower and sugar beet crops while there is no gain for other crops (maize and soybeans). Investigation of a longer time-series of SAR images as well as SAR capabilities to identify winter rapeseed is planned within the SOAR-JECAM project for 2013 and will be covered in future works. - Gallego F.J., Kussul N., Skakun S., Kravchenko O., Shelestov A., Kussul O. 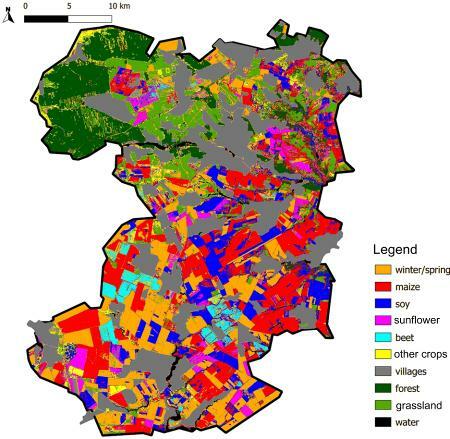 “Efficiency assessment of using satellite data for crop area estimation in Ukraine”, International Journal of Applied Earth Observation and Geoinformation, 2013, submitted to Special Issue “EO agriculture and agri-env monitoring”. - Kussul N., Skakun S., Shelestov A., Kravchenko O., Kussul O. “Crop Classification in Ukraine Using Satellite Optical and SAR Images”, International Journal “Information Models and Analyses”, 2013, Volume 2, Number 2, pp. 118-122. - Kussul N., Skakun S., Kravchenko O., Shelestov A., Gallego J.F., Kussul O. “Application of Satellite Optical and SAR Images for Crop Mapping and Erea Estimation in Ukraine”, International Journal “Information Models and Analyses”, 2013, Volume 7, Number 3, pp. 203-211. - Kussul N. “Agricultural Satellite Monitoring and Crop Yield Forecasting in Ukraine”, EC-JRC Worksop on “Crop Yield Forecasting in South East Europe”, 30-31 May, 2013, Skopje, Macedonia. - Kussul N. “EO for agriculture monitoring in Ukraine within international initiatives GLAM and JECAM”, GEO European Projects’ Workshop-7, 15-16 April, 2013, Barcelona, Spain. - Skakun S. “Disaster monitoring and risk assessment using EO and SensorWeb”, GEOSS Future Products Workshop, March 26, 2013, NOAA, Silver Spring, USA. Copyright © 2011 - 2013 Space Research Institute NAS and SSA of Ukraine. All rights reserved.